If you are looking for something a little more secure to house your iPad 2, which can then be securely attached to a fitting to stop over enthusiastic users walking of with it. The new TechSafe iPad 2 case unveiled by Griffin might be worth a look. 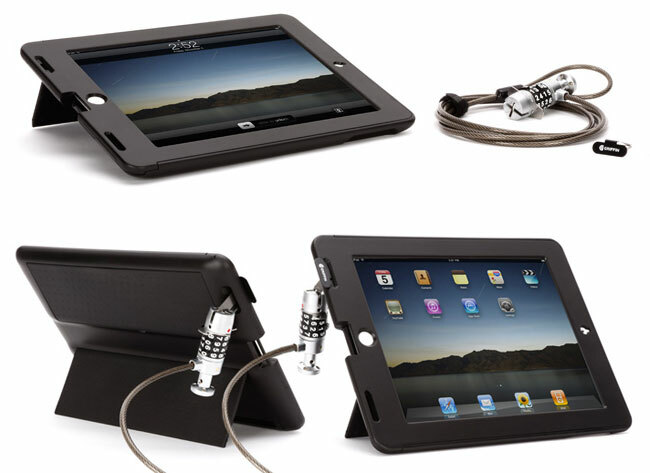 The Griffin TechSafe case has been designed to protect your iPad 2 from bumps and scratches, but also locks securely around your iPad 2 and provides a two secure anchor points which can be used with any desktop cable locking system. The TechSafe Case for the iPad 2 comes supplied with its own combination-lock security cable, and the case features two foldout workstands, one for typing and tapping, and one for upright landscape viewing, as pictured above.